A member of the U.S. Coast Guard walks down heavily flooded Mill Creek Road after Florence hit Newport N.C., on Saturday. Catastrophic flooding from Florence spread across the Carolinas on Sunday, with roads to Wilmington cut off by the epic deluge and muddy river water swamping entire neighbourhoods miles inland. “The risk to life is rising with the angry waters,” Gov. Roy Cooper declared as the storm’s death toll climbed to 16. The storm continued to crawl westward, dumping more than 30 inches of rain in spots since Friday, and fears of historic flooding grew. Tens of thousands were ordered evacuated from communities along the state’s steadily rising rivers – with the Cape Fear, Little River, Lumber, Waccamaw and Pee Dee rivers all projected to burst their banks. About 70 miles (115 kilometres) away from the coast, residents near the Lumber River stepped from their homes directly into boats floating in their front yards; river forecasts showed the scene could be repeated in towns as far as 250 miles inland as waters rise for days. Half way around the world, meanwhile, Typhoon Mangkhut barrelled into southern China on Sunday after lashing the Philippines with strong winds and heavy rain that left dozens dead. More than 2.4 million people were evacuated from China’s southern Guangdong province ahead of the massive typhoon, the strongest to hit the region in nearly two decades. U.S. President Donald Trump said federal emergency workers, first responders and law enforcement officials were “working really hard.” As the storm “begins to finally recede, they will kick into an even higher gear. Very Professional!” he declared in a tweet. The storm’s death toll climbed to 16 when a pickup truck ran into standing water in South Carolina and the driver lost control, hitting a tree, authorities said. Two other people also died in storm-related wrecks, and two more people died from inhaling carbon monoxide from a generator in their home. Kenneth Campbell had donned waterproof waders intending to check out his home in Lumberton , but he didn’t bother when he saw the Coast Guard and murky waters in his neighbourhood. Stream gauges across the region showed water levels rising steadily, with forecasts calling for rivers to crest Sunday and Monday at or near record levels. The Defence Department said about 13,500 military personnel had been assigned to help relief efforts. 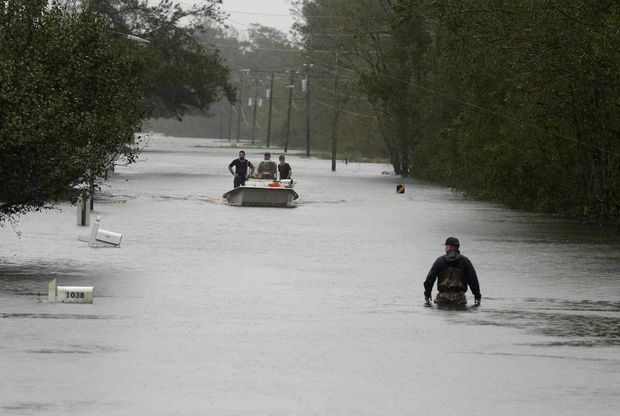 Near the flooded-out town of New Bern , where about 455 people had to be rescued from the swirling flood waters, water completely surrounded churches, businesses and homes. In the neighbouring town of Trenton, downtown streets were turned to creeks full of brown water.